Team Building | Ben Miller: Speaker, Coach, Pizza Enthusiast. 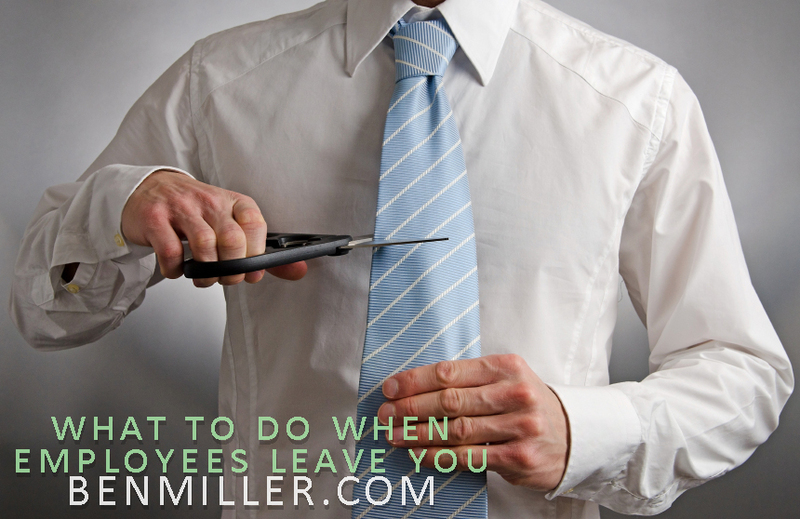 Have you ever had a great employee leave? I have. It stung. In fact, it happened to me more than once. In my business I had several different types of employees. I had office, production, and performance staff. Each one took a special level of training and mentoring to bring them to the level that I needed them to be at in order to serve our clients. I’ll never forget when my best video guy came in and told me he had taken another job. I felt like I had been punched in the chest. But he was unhappy. His talents weren’t being utilized in our office, and I had him doing things he didn’t like (which, if you read yesterday’s article, is a big no-no). In fact, I broke almost all of MY rules in hiring him. I didn’t have the money (or a plan) to hire him, I didn’t have a strong job description, and he cost me way more than he brought in. I was just impressed by his talent and wanted him to work for ME. In retrospect, he could have found an awesome full time job, and I could have offered him a TON of freelance work. But that didn’t change the fact that I did hire him and he did quit. Two things happened when he quit… 1) I panicked and 2) I panicked some more. I thought I would NEVER find anyone else like him. We’re a small company! I can’t survive without him! Thankfully, it turns out I was wrong. We did survive, and this employee and I stayed friends. In fact, I was able to toss him a bunch of freelance work that he could choose whether or not he wanted to do it. It was the best of both worlds. The best news, he was able to find a job that he loved that paid twice what I was paying. We have to remember that our employees are human. If you had the opportunity to do something you loved and got paid twice as much, AND you got to stop doing things you didn’t like… well… wouldn’t you take that job in a heartbeat? I would too. Employees leave. We can’t get around that. But, if you spend a ridiculous amount of time in the hiring process, you’ll find that your team members will feel like they’ve EARNED the right to work for you. If you’re lucky, they’ll leave less often. When they do leave, treat them with kindness. Throw them a party. Show the rest of your team that you don’t have any hard feelings towards them. Treat them as you would want to be treated. Most importantly, have an exit interview with them. Make them feel comfortable to open up about why they’re leaving. Give them the opportunity to talk about things that you and the rest of your team need to improve on. I’ve found that most people will keep that stuff to themselves until they’re not afraid of persecution. Once they know they’re leaving, give them the opportunity to vent if need be. But most of all, make it painless for them. Can you afford to hire a new employee? Copyright 2014 . Ben Miller . Try the veal, tip your waitress, I'm here all week!